What kind of bizarre world is it where this song attributed to [feat. Natalie Cole]? In the proper and just universe, that is Natalie Cole [with that “You’ve Got a Friend” guy, but you barely notice him]. I reckon he gets the credit because it’s from his album James Taylor at Christmas, but, still. This album fits in with the mellow 1960s sound found on the other Christmas albums I’ve reviewed so far this year (you can find them here). As you might know, gentle reader, it was Herb Alpert and the Tijuana Brass that initially led me into collecting albums from the 1960s in the easy listening genre, and when I saw this album at an antique mall, I bought it. You can tell I’m serious because I paid $5.00 for it. You can really tell I’m serious about it because I paid $5 for the LP when I’d already received the CD as a Christmas gift. Or perhaps you know that I like to spin records at Christmas. At any rate, the album features mostly secular winter-time songs associated with Christmas, but has “The Christmas Song” and a bit of a religous Bach piece called “Jesu, Joy of Man’s Desiring”. You don’t tend to see “Las Mañanitas” on a Christmas record as it’s a traditional Mexican birthday song, but it could fit the Christ birth theme. 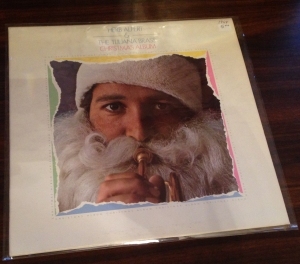 “The Bell That Couldn’t Jingle” is a particularly nice bit with Herb Alpert on the vocals. Did you know Herb Alpert is the only artist to win a Grammy for an instrumental and a vocal performance? True fact. Not this song, though, although his gentle tones offer a mellow bit of encouragement. I like this album plenty and play it a bunch, both on the turntable and on the CD when I’m not in my parlor. Let that be a ringing endorsement. This album represents the Reese’s Peanut Butter Cup of albums. As you might know, I have two Dean Martin Christmas albums (The Dean Martin Christmas Album and Winter Romance) as well as White Christmas by Jackie Gleason. So when I cannot decide which to listen to, I can drop this platter on the turntable and enjoy the best of both. This album collects some of the Capitol songs of both from the aforementioned albums and mixes them together. So you have songs with Martin’s warm flair followed by instrumental big band numbers by Gleason’s orchestra. 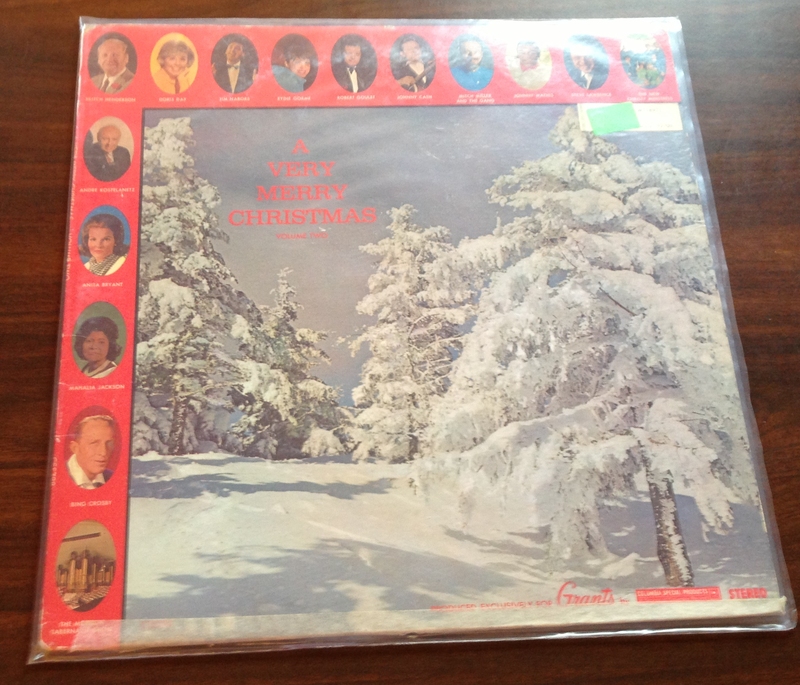 Of the selections, most are standards, but “Snowbound for Christmas” is the new song, and “Rudolph the Red-Nosed Reindeer” might be from the original Winter Romance; it is not on either the reissue of Winter Romance I have nor The Dean Martin Christmas Album. So it lies in the sweet spot between a compilation album of many different voices and a record with a single singer or group. It’s two acts I enjoy greatly, and I’m happy to have picked this disc up this year. I’d recommend it if you can find it for a couple of bucks out in the wild. Or, like I did, for a buck at a book sale. This album comes in two flavors: The original version, depicted below in the Amazon link, and the 1964 reissue depicted to the right, which is the edition I have. The two differ by a couple of tracks: The original includes “White Christmas” and “Rudolph, The Red-Nosed Reindeer” which makes it a more straight-ahead Christmas album. The reissue, on the other hand, has no explicit Christmas songs at all. 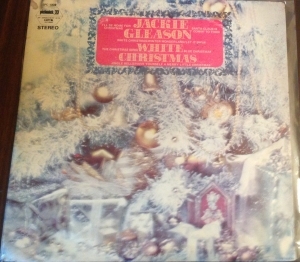 Instead, the songs are all about cold and the winter, but some are standard songs on Christmas albums and radio stations, including “Baby, It’s Cold Outside”, “Winter Wonderland”, and “Let It Snow”. Some are jazz standards that you hear all year round, like “I’ve Got My Love To Keep Me Warm” and “The Things We Did Last Summer” (although I hear them all year round because I listen to jazz standards throughout the year–if you don’t, you probably won’t). In that regard, I can play the album well into January, although it’s not particularly cold here in southwest Missouri (especially for a Wisconsin native). 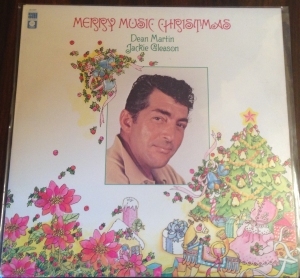 As it is Dean Martin, it’s in pretty heavy rotation at Nogglestead as is Martin’s The Dean Martin Christmas Album. And I’ll be honest, I’ll never be brave enough to try the sweater over a turtleneck look, but I’m not living in the past, just listening to the past. Also note that now that I know it exists, I’ll be on the lookout for the original release with the more Christmas flavor. If nothing else, it will make yet another Christmas album review someday. If you like the mellow orchestral mood music sound of Jackie Gleason presents albums, you will love this album. It’s a welcome departure from the normal Christmas record orchestration, with the reliance on traditional choir, organ, and bells/chimes. These are swanky orchestrations for a holiday get-together or a nice bit of background music for baking. No snow required! 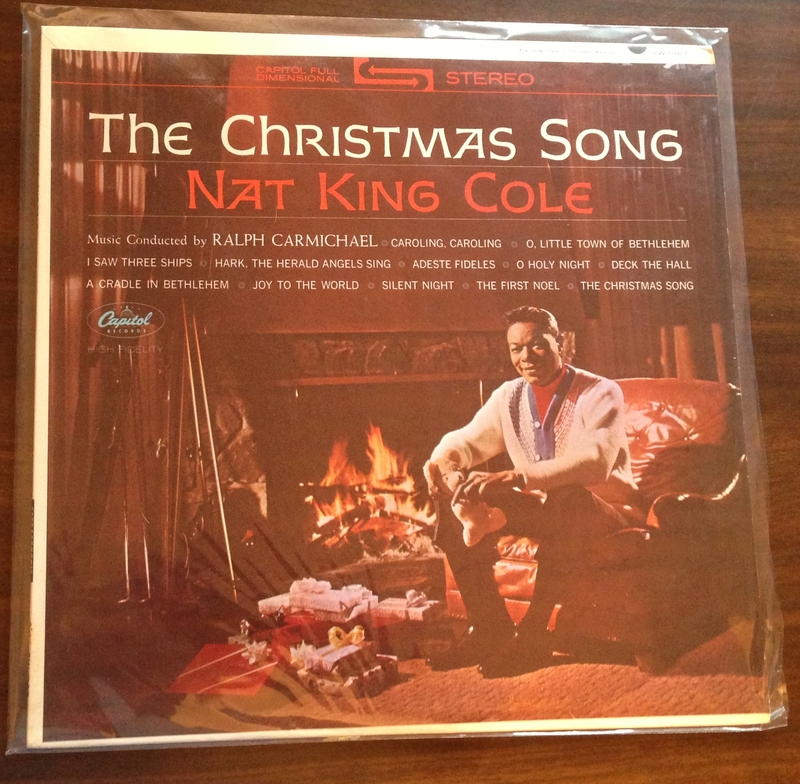 It’s not my favorite Christmas album, and it’s not my favorite Jackie Gleason presents disc (that would be Music, Martini, and Memories or The Torch with the Blue Flame), but it’s an excellent addition to the rotation at Nogglestead. I’m glad I picked it up this year. It’s not really the Christmas season when it comes to record albums, ainna? It’s Bing Crosby season. So let’s get this year’s Christmas album reviews off to a proper start, with this album. It was recorded in 1955 and released as a record in 1956. 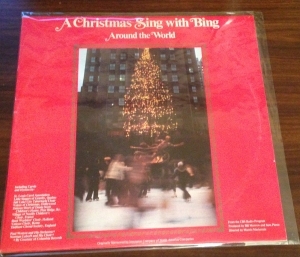 It’s from a radio broadcast that Bing did on Christmas Eve, so it’s chock full of not only songs that he performs, but also bits recorded by others. Like many albums I’m planning to review this year, it features the spoken word–in this case, Bing’s introductions to the songs and the cutaways. The album dates from 1956? 1958? But the pressing I got dates from 1973 or so. Reissued 25 years later. So you know there was a market for it. Whether there still is, I don’t know. Pretty stock stuff, but with some different bits in there (“Thou Descendeth from the Stars”, “What Christmas Means To Me”, “Jesus, Sweet Savior”). The most interesting part, of course, is the recreation of an old time radio broadcast. I like it a bunch, and I’ve got it on steady rotation this year so far. 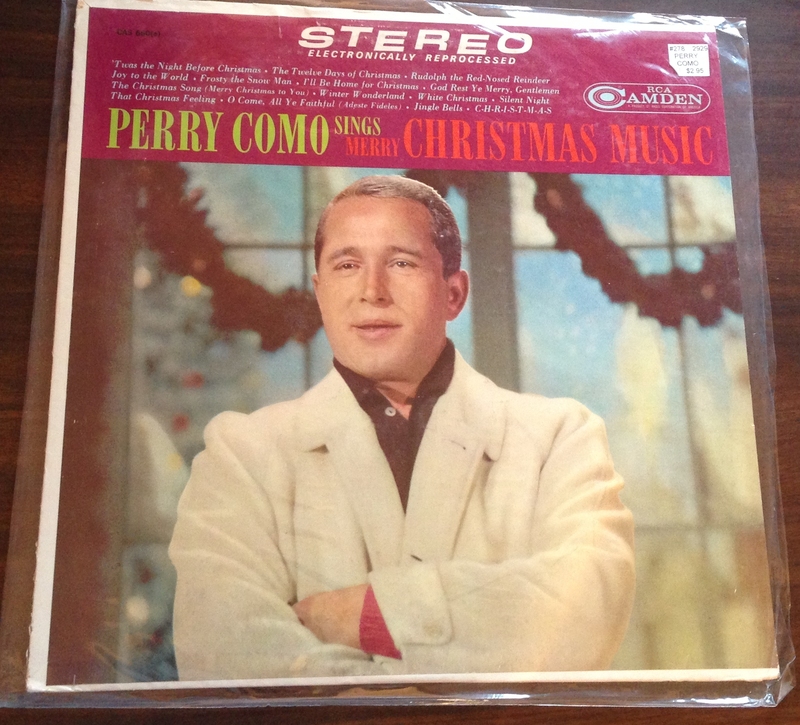 This album differs from some of the other Bing Crosby compilations (such as Christmas with Bing) because it’s a Christmas album as a Christmas album, not a collection of other songs from other records. This one features more swing to it, as it was recorded in the 1950s while Bing was relatively young and not later as he grew to be an elder statesman of music and television host. Several tracks feature the Andrews Sisters as well to give you an idea. The song “Faith of our Fathers” is new; the others, although standards, have a little zip on them and are festive. 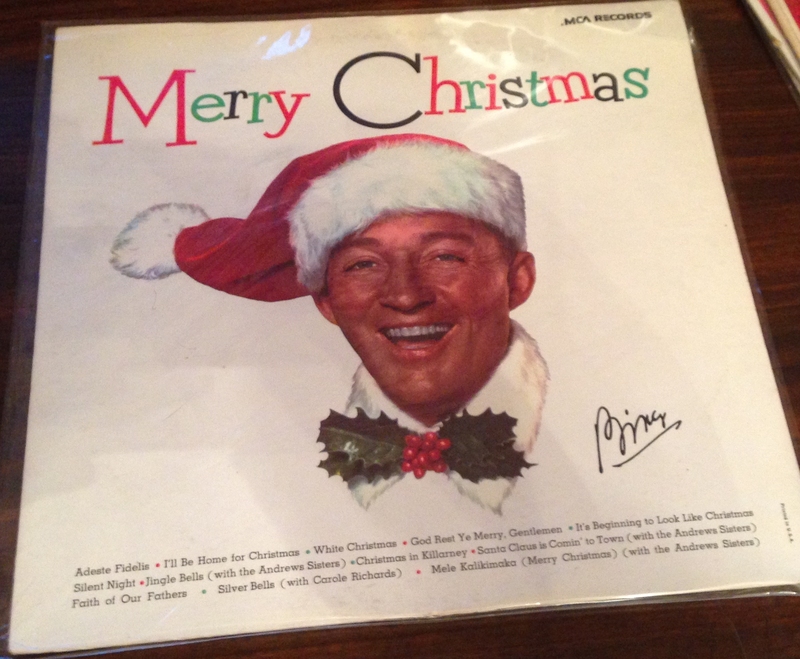 Overall, it’s a good listen for the holidays and breaks out of the normal Bing Crosby ouevre. 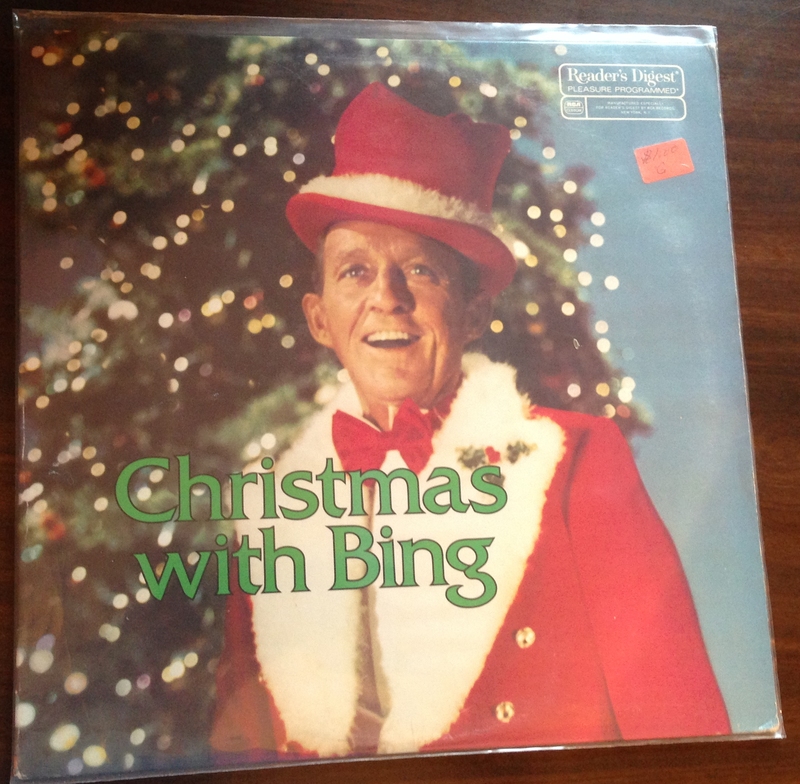 Which, I suspect, many Bing Crosby albums do once you move beyond the often-anthologized. I got this album a couple of years ago, and I play it a couple of times a week throughout the season. It’s a serviceable collection of known favorites and a song that appears sparsely on Christmas albums (“Mistletoe and Holly”). It’s good background music, but it’s not ideal mood music because Sinatra’s more of a technical perfectionist of a singer rather than a warm singer who inhabits the songs. That is, when you hear these songs, you imagine being in a room where Sinatra is singing the songs on stage instead of someone who’s singing the songs with you. According to Discogs, this is one of the more expensive Christmas albums I’ve reviewed so far. And I only spent a buck on it at a book sale if I remember correctly. 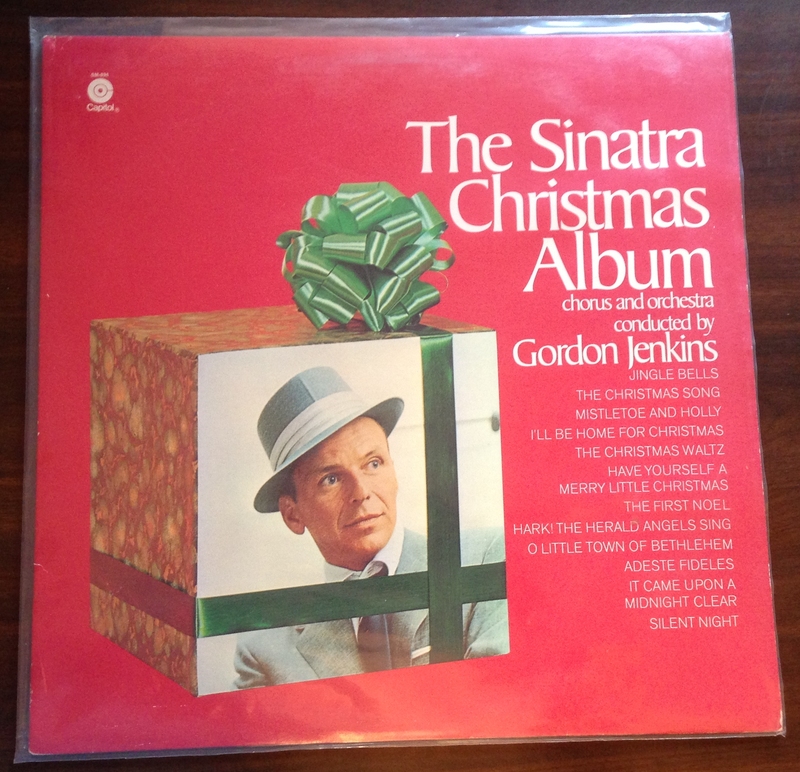 So it’s worth a couple of spins every year in fairly heavy rotation at Nogglestead, but mostly it’s because of the Sinatra cool factor than the music itself. 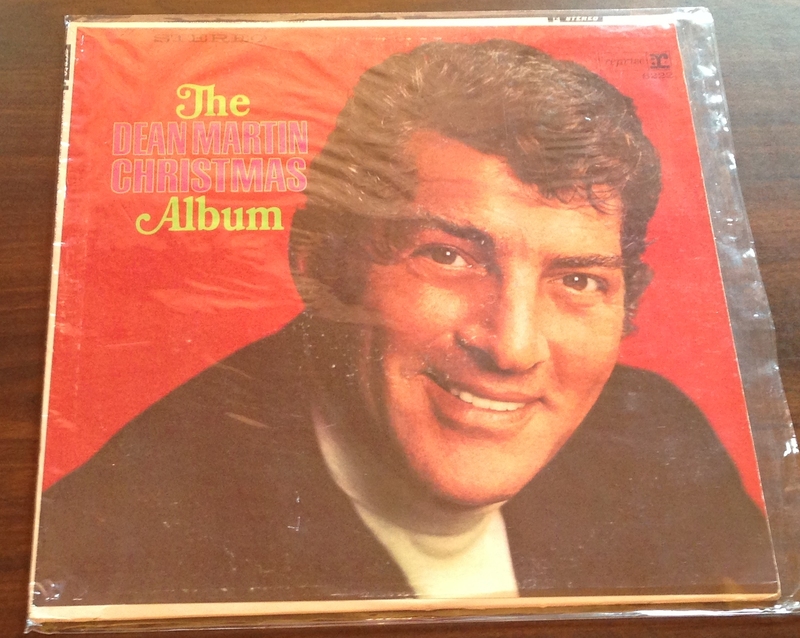 Speaking of the Rat Pack, I’ve already reviewed the The Dean Martin Christmas Album. This album belonged to my mother from the time she served in the Marine Corps; the address label in the corner was for El Toro MCAS. The price tag in the corner means she tried to sell it at one or more yard sales after she moved on from LPs. Obviously, it didn’t sell, which is fortunate, since it is a relic from my youth I can hold onto. It’s a compilation album, and the second of a series. It has Christmas carol standards by a number of the popular artists from the middle of the 20th century. It’s a fine mix, and I enjoy the compilation albums more than most Christmas albums by a single artist simply for the variety’s sake. 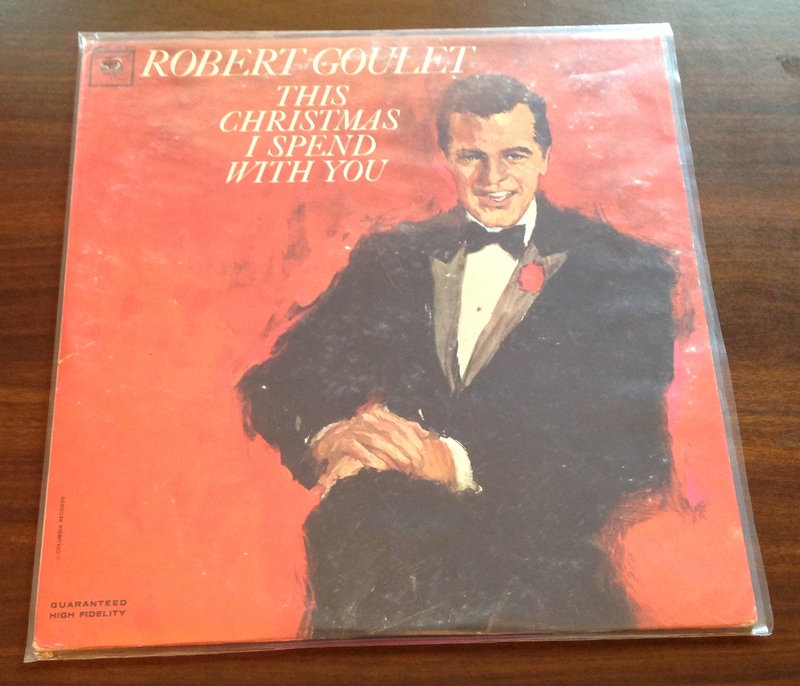 Some songs on the compilations appear on some of the individual albums (cough, cough, Robert Goulet). This album includes “I Heard the Bells on Christmas Day”, a song not found on many of my other compilation discs and a couple of artists I’ve not heard of or seen in record bins (Mahalia Jackson, Skitch Henderson and His Orchestra). 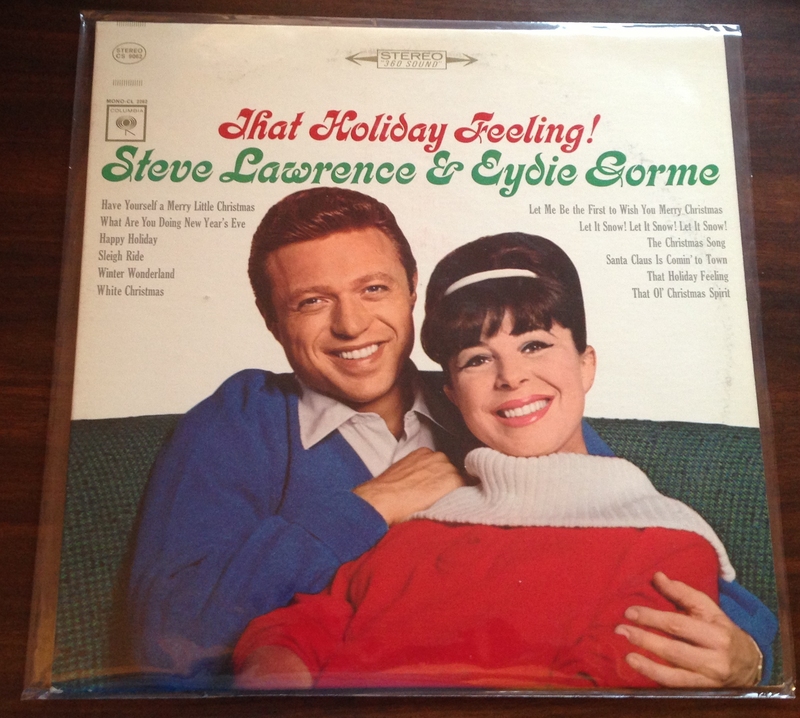 Additionally, this album, played in my youth, would have been the first times I heard Eydie Gorme, and how could I tell thirty-five years ago how big of a fan of hers I would become? At any rate, this album is aces and gets a lot of play during the Christmas season here. 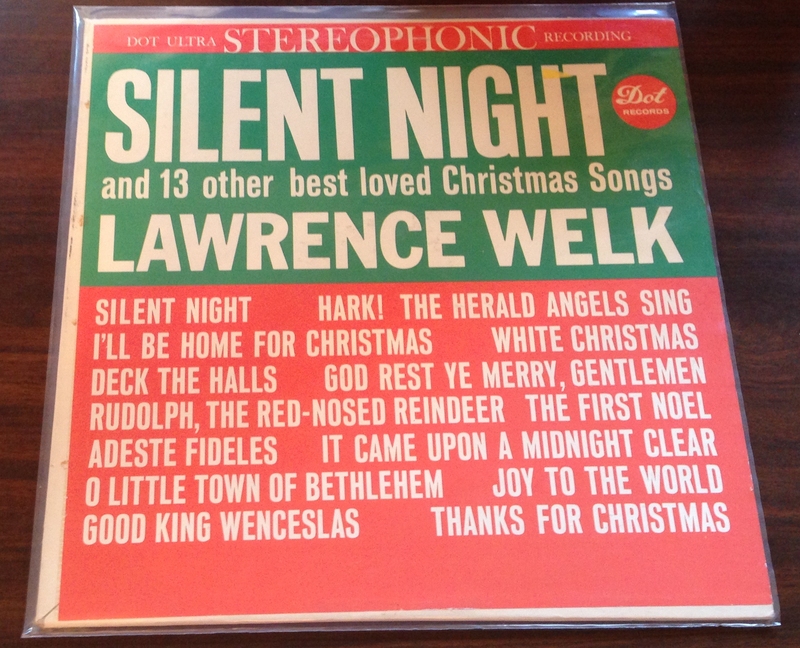 This album features Kate Smith of “God Bless America” fame singing a selection of Christmas carols and other things. 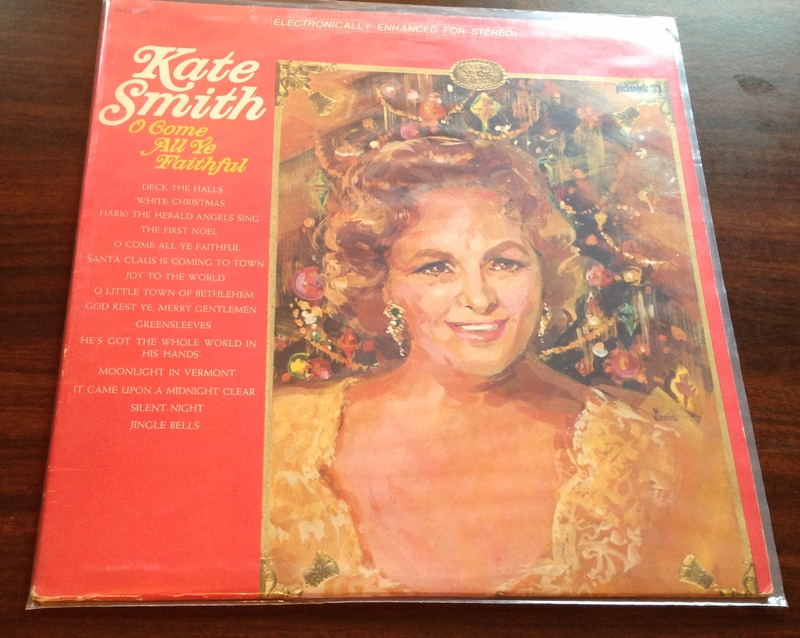 I know, a day after saying that Robert Goulet’s Christmas album was too big, I’m giving a favorable review to Kate Smith’s. However, the different between the two is a big voice and a big delivery. Although Kate Smith has a big voice, she’s singing these songs instead of belting them out. Additionally, she’s balanced well with the other musicians on the album, including other vocalists who help out and the instrument arrangements. Besides, Kate Smith is like your grandmother singing these things if your grandmother could sing. The set includes a couple of interesting, non-Christmas specific songs (“He’s Got The Whole World In His Hands” and “Moonlight in Vermont”) which tangentally touch on the theme. They’re nice enough interludes in the Christmas music to be welcome. You can get this album in vinyl or MP3 on Amazon, but it looks to be a collection that the studios overlooked when releasing material on CD. I, of course, recommend the vinyl. This album comes from early in Goulet’s career; in 1960, he got his big break in the musical Camelot, and three years later this album was out. You can tell that Goulet’s got a musical theatre background from this album, as he’s not so much singing these songs in a recording studio as he’s booming these songs out so you can hear them in the cheap seats. Given the booming presentation of each, this record does not get a lot of play. I think I hit it once last year (the first year we owned it), and I played side one this year. And that might be enough. It’s not mood music, and it’s not background music. It’s like a recording of a concert, and I’m not into live albums. But if you’re into musical theatre or to an over the top style, perhaps it would be to your liking. 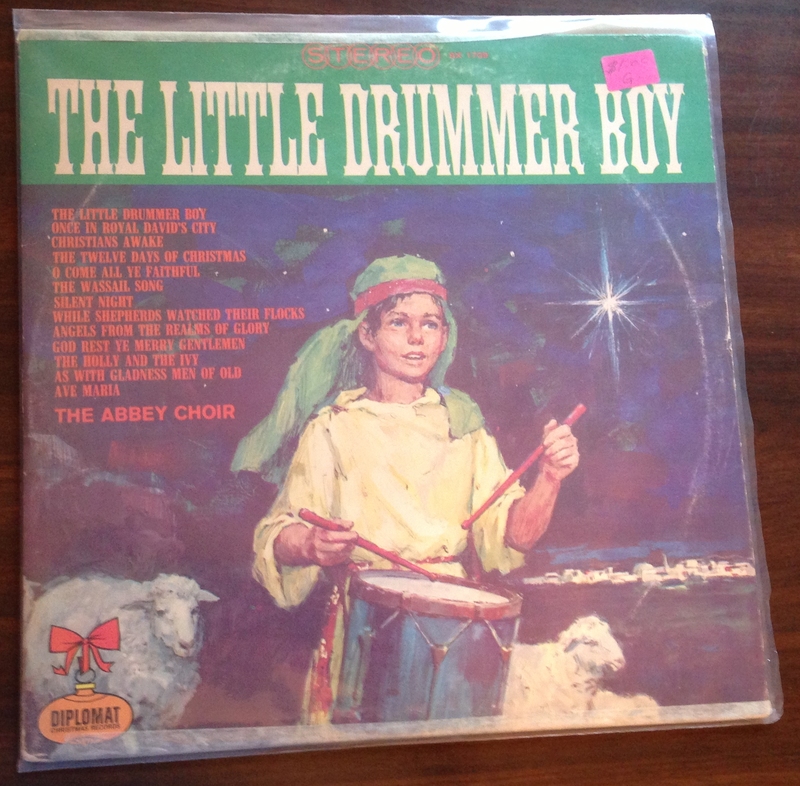 This album is less of a big band sound than a modified bell and chimes choir sound. There are no singers vocalizing the words from the carols, but there are some choral voices singing notes to accompany the orchestra. And, as I said, bells and chimes (and harpsichord) are featured, but they’re backed with a depth of other instruments. So it falls somewhere in between a bells and chimes album and an instrumental bell album. I bought this album this year, so I don’t have a large sample size of its presence in the rotation, but it’s pleasant enough to have as background music while cooking or otherwise doing things in rooms adjacent to our parlor, where we have the record player and its records. But it’s not mood music, where you want to be in the same room while the record plays. 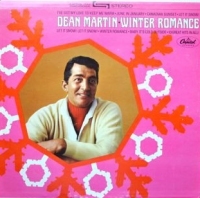 If you’re expecting “Baby, It’s Cold Outside” on this album, baby, it’s the wrong record; that omnipresent song, the one most associated with Dean Martin and Christmas, is from his 1959 platter A Winter Romance. It’s a mood-setting collection, which is a step above background music; it’s worth listening to Dean sing the songs as he invests feeling in them, and his relaxed delivery is reflective. My beautiful wife quibbles with the inclusion of “Marshmellow World” on the album, as it is her least favorite secular Christmas carol of all time and might be mathematically the absolute worst song for her ever as she cannot stand marshmallows, whipped cream, or most of the things the winter landscape reminds the singer of. On the other hand, it transitions right into “Silver Bells”, which is her favorite secular Christmas carol, so the crisis is averted. Meanwhile, I think it’s odd to include “The Things We Did Last Summer” on the LP as it’s more of a reflective, nostalgia song than a winter song or a Christmas song. But I guess it gets included to break the theme up a little bit with a tangental tune, like “A Few of My Favorite Things” gets included on Christmas albums because it mentions packages and gifts. At any rate, I recommend it; it’s definitely on heavy rotation here at Nogglestead.